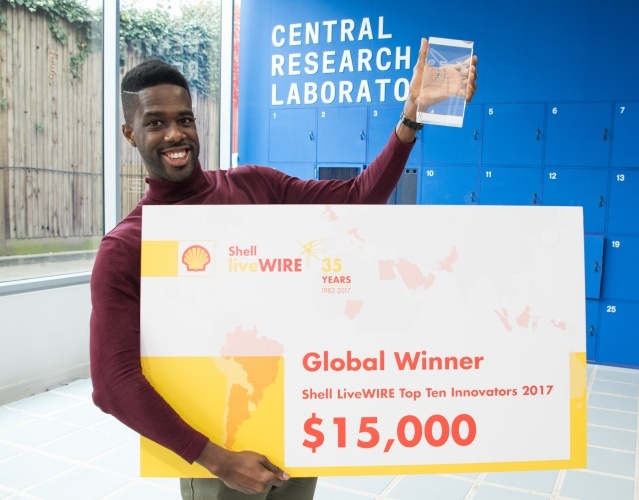 Former Brunel University student Carlton Cummins has been awarded the top prize in a global innovation competition run by Shell. Carlton is the co-founder of Aceleron, a startup that recycles old lithium-ion batteries into new energy storage products. He was named the winner in the 2017 Shell LiveWIRE Top Ten Innovators competition, beating 22 other young entrepreneurs from nine different countries. According to Carlton, he will use the $15,000 prize money to pilot an off-grid home solar energy system aimed at the Central American market, using upcycled waste batteries. Earlier in the year Carlton received £30,000 after he was named Shell LiveWIRE UK’s Young Entrepreneur of the Year. According to Aceleron’s website, the company is able to provide serviced lithium batteries at the same price as lead acid batteries. The low-cost entry point makes battery storage technology accessible to a much wider proportion of the population, and has the potential to promote localised renewable use in developing countries. The judging panel also included Maytha Al Habsi, Deputy CEO at Emirates Foundation; Esther Wang, previous winner and Founder of Joytingle; Lindalia Junqueira Reis, CEO at Ions Innovation Consulting; and, Gwen Abiola-Oloke, Investment Director of Western Africa at GroFin. The other entrepreneurs that featured in the Top Ten were awarded prize money of between $5,0000 and $10,000. Congratulations are surely absolutely deserved!